Most of us can name a teacher, instructor, or professor who had a profound positive impact on our learning and life. 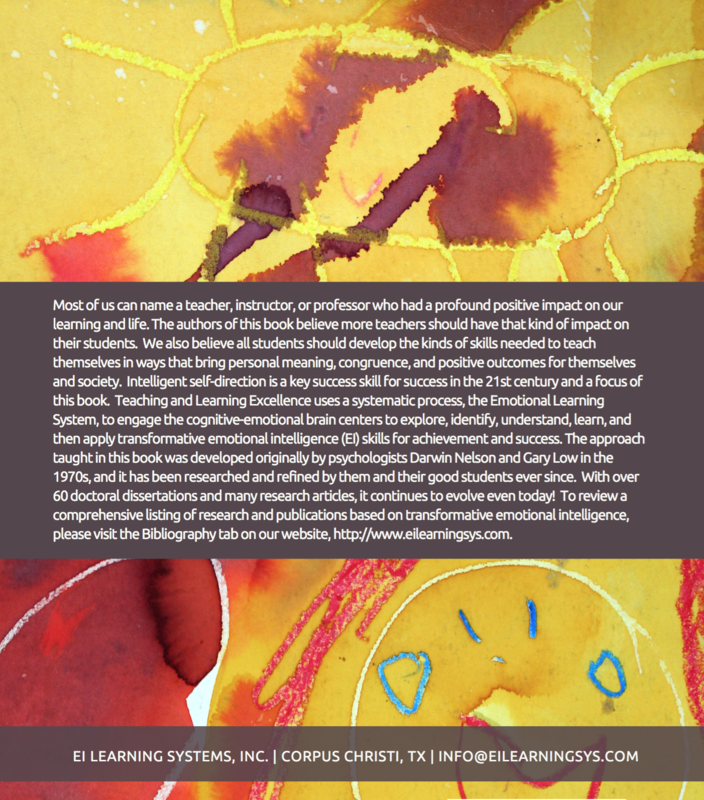 The authors of this book believe more teachers should have that kind of impact on their students. We also believe all students should develop the kinds of skills needed to teach themselves in ways that bring personal meaning, congruence, and positive outcomes for themselves and society. Intelligent self-direction is a key success skill for success in the 21st century and a focus of this book. 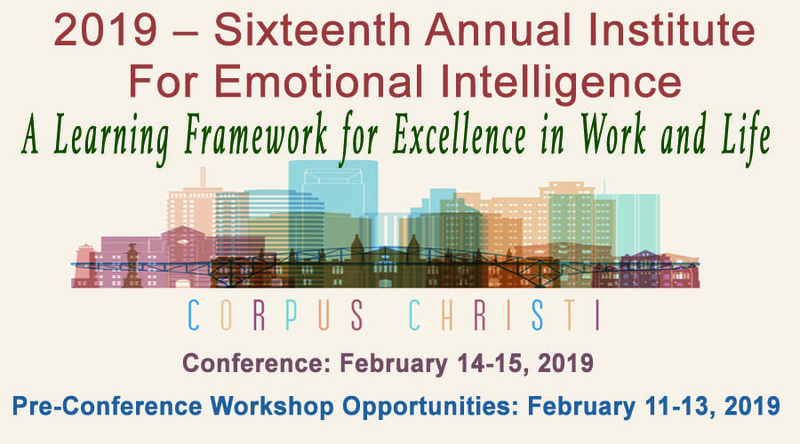 Teaching and Learning Excellence uses a systematic process, the Emotional Learning System (ELS), to engage the cognitive-emotional brain centers to explore, identify, understand, learn, and then apply transformative emotional intelligence (EI) skills for achievement and success. The approach taught in this book was developed originally by psychologists Darwin Nelson and Gary Low in the 1970s, and it has been researched and refined by them and their good students ever since. With over 60 doctoral dissertations and many research articles, it continues to evolve even today! 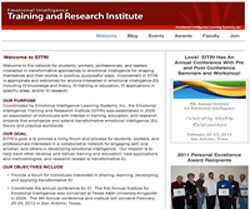 To review a comprehensive listing of research and publications based on transformative emotional intelligence, please visit the Bibliography tab on this website. http://www.eilearningsys.com. … as a former teacher and teacher educator of special needs students, I was always looking for an educational framework that works, is positive, and produces good results. After reviewing this book it is evident that “Teaching and Learning Excellence” is applicable to all segments of today’s students, including those with challenges. The Learned Ability Model described in Chapter 3 along with Chapter 5 on the EI-Centric Curricula hold exciting promise for transforming individuals of any age and ability. … as students and adults grow and develop, their journey needs a road map by which to travel less they get lost or sadly yet-never arrive to their destination. EI systems for teaching and learning can provide both positive, meaningful directions in addition to successful outcomes – a goal to which we all aspire. American and International education today is focused on high educational attainment, rapid results, sustained accountability, and both short and long-term success, which is why this book is so timely. “Teaching and Learning Excellence” and the approaches it describes provides an important guide or map we can use to help many students and adults stuck in the wilderness or underachieving into today’s schools and society. I am of the belief that this is their best work yet. Over the years I have been a participant in their research, attended several of their annual conferences, and even presented a paper at one of the conferences, so I have been very close to their professional services. I also believe that the procedures and concepts involved in this current book holds enormous potential for improving lives and achieving success⎯ one individual at a time. Human beings have two unique abilities or capacities that distinguish them from all other life forms: (a) the ability to think reflectively and (b) the awareness that we are imperfect. 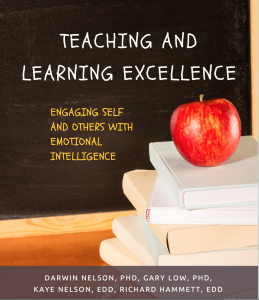 Teaching and learning excellence involves developing and applying constructive thinking (emotional intelligence) skills and perfecting ourselves by achieving a meaningful personal goal each day. The goal of teaching and learning excellence is to become your best self and to do your best (achieve excellence) in what you do and how you are in relationships with others. We offer this book as a a personal change process that involves your beliefs, thoughts, emotions, and behaviors. Your brain and your behavior are complex, and positive change occurs one step at a time. We all have the potential within us to develop excellence and well being. Teaching and learning excellence is the process of changing and improving yourself in ways that are valuable and meaningful to you. Our hope is that you will experience this book as an engaging conversation that is helpful to you as a person and as a teacher. We have made our best attempt to keep the conversation direct, brief and clear. We accept responsibility for our beliefs, thoughts, emotions and behaviors and respect your right to differ. We ask only that you experiment with the process of teaching and learning excellence, and determine its value and benefit for you as you work with others. Pricing: $40. Please contact us for more information.